You could say this is a Sacred Heart weekend. Today is the feast of St John Eudes, a 17th century French priest whose personal spirituality focused on the love of Jesus and Mary, symbolised in their Sacred Hearts. It is thanks to his - largely unsung - efforts that we have a feast and a liturgy of the Sacred Heart. And tomorrow it's St Bernard of Clairvaux, who was part of the great flourishing of Heart-centred mysticism in the 12th and 13th centuries. But this weekend comes in the wake of deadly terrorist attacks in Spain and Finland, when we have, once again, seen what hate can do - and how love and humanity can respond. It comes only a week after hatred, violence and white supremacy reared their ugly heads in Charlottesville, and robbed three more people of their lives, including one very deliberate death due to terrorism. It comes when so many of us are sickened, weary and uncomprehending - how could people hate so much, even unto casual murder? And how could others condone and even celebrate such evil? And it comes as we continue to ask ourselves: what more can we do, as educators, as people of goodwill, as believers in the power of love and reconciliation, and indeed, as people who have pledged our lives to the primacy of Love? What more are we called to, according to our charism of a wide-open, all-embracing Heart which is all love? 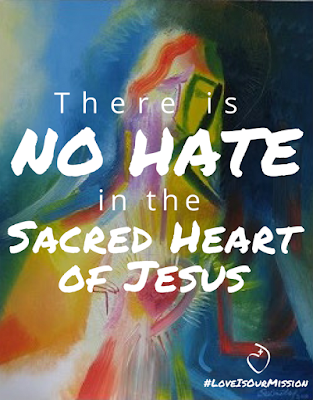 As I was musing on all this, this image by one of my US sisters - using a painting of the Sacred Heart by Stephen B Whatley - appeared in my Twitter and Facebook feeds. And yes, I realised: there is always room for everyone, in that wide-open, all-embracing Heart - but not for everything. We say that there are no border controls at Jesus' Heart, no barriers or walls, but actually, there are. There is no room for hate, or any of its violent, divisive outcomes: they simply will not, cannot get in; or if they are allowed in, it is only so that they may be transformed by dwelling in this place of abundant, limitless Love. Which means that we who aim to live in and serve from this Heart must search our own hearts, our own baggage, very carefully - not just for hatred, which can be screamingly obvious, but for all its subtle, corrosive spin-offs, all its long-held grudges and latent anger. And we must be willing to let go of whatever we find, and offer it to this all-loving Heart, for purification, and transformation into something which is only of and for Love. There is no hate in the Heart of Jesus... and if we wish our own hearts to be united and comformed to his, if we want our mission to truly be his love, then there can be no hate in ours.